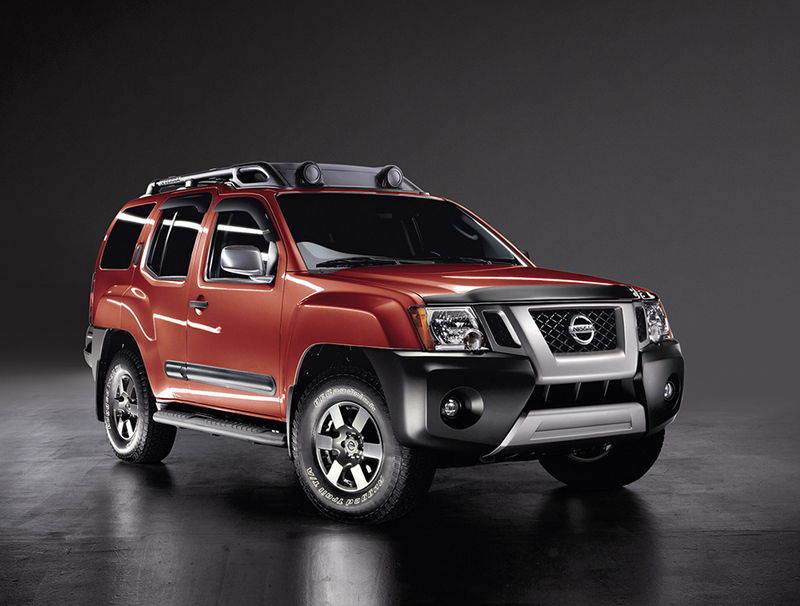 The adventure-ready Nissan Xterra continues to combine power, utility, value and authenticity for the 2013 model year – inspiring and facilitating outdoor enthusiasts to "attack life" wherever they go. Xterra's distinct "multi-flex" interior provides an abundance of useable space, storage and convenience features – including an available Easy Clean cargo area, Utili-Track® cargo-carrying system, tie-down channel system, 10 cargo hooks and an available built-in first-aid kit. For the 2013 model year, PRO-4X models add updated contrast stitching and seat embroidery, auto on/off headlights, outside temperature display, RearView Monitor and navigation system; S models add Display Audio with CD/AM/FM/Aux/USB, SiriusXM Satellite Radio (SiriusXM subscription required, sold separately); and all models receive slide-on-rod style sunvisors. Two new exterior colors are also available: Glacier White and Cayenne Red. Available in three well-equipped models – X, S and PRO-4X – all 2013 Xterras feature an advanced 4.0-liter DOHC V6 engine, rated at 261 horsepower and 281 lb-ft of torque, along with a rugged "F-Alpha" truck platform for adventure-ready performance. The "F-Alpha" platform is shared with the full-size Nissan Titan pickup and Armada SUV. Xterra is available with a choice of 6-speed manual (S 4x4 and PRO-4X 4x4 only) or 5-speed automatic transmissions and a choice of part-time 4-wheel drive or 2-wheel drive. While maintaining its tough gear positioning, Xterra also offers a range of advanced technologies, including Bluetooth® Hands-free Phone System, SiriusXM Satellite Radio (SiriusXM subscription required, sold separately) and 300-watt Rockford Fosgate® audio system with 8 speakers and subwoofer. 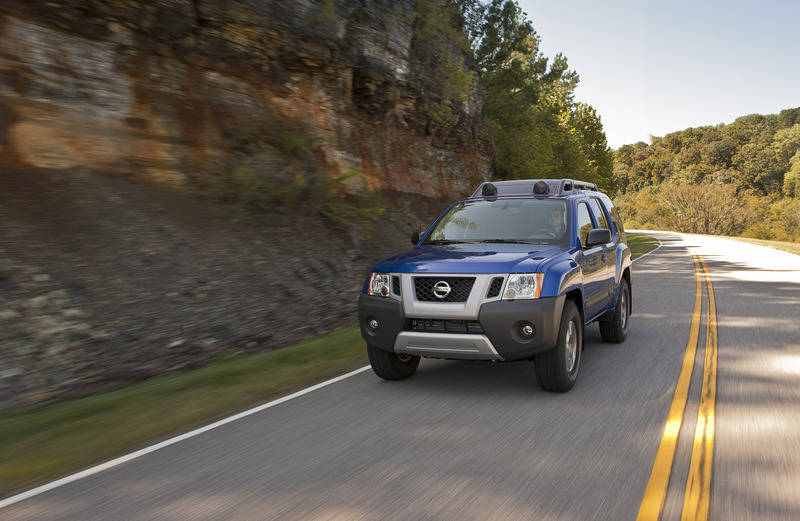 Staying true to the original breakthrough Xterra design concept of offering drivers "everything you need and nothing you don't," Xterra combines its signature bold exterior styling with a spacious, flexible, adventure-ready interior. The exterior design includes large flared fenders, a powerful-looking hood and headlights, Nissan SUV-style angled strut grille, a versatile roof rack with latchable lid and a rear bumper design with side steps for easy access to the roof rack. Roof-mounted off-road lights, built into the roof rack air dam, are standard on PRO-4X models, along with cargo gearbox and 16-inch bright machine-finished aluminum alloy wheels. 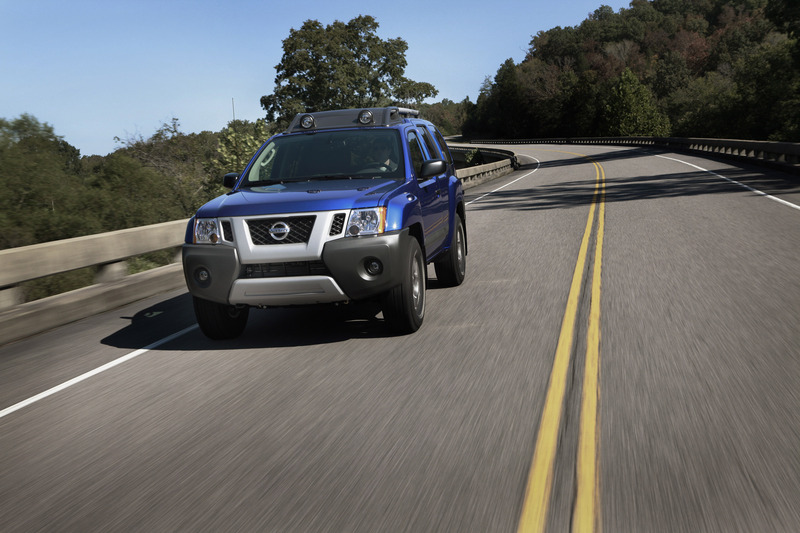 The 2013 Xterra is offered in seven available exterior colors –Glacier White, Cayenne Red, Metallic Blue, Brilliant Silver, Night Armor, Super Black and Lava Red. Xterra's long wheelbase help provide a smooth ride and ample interior room, yet overall length is highly manageable due to the short front overhang – helping to enhance maneuverability in off-road hill climbing and trail situations. Xterra's flexible interior is spacious enough for up to five adults and their gear, with ample legroom, headroom and cargo room. A standard 60/40-split folding stadium-style rear seat with removable seat bottom cushions and an available fold-down front passenger seat (PRO-4X model) create added utility for hauling long recreational gear. Standard interior features include sporty reclining front bucket seats, footrest, dual front and rear 20-ounce cupholders, power windows, power locks, power mirrors, Remote Keyless Entry and cruise control with steering wheel-mounted controls. All Xterra PRO-4X models feature unique seat cloth and white contrasting stitching, with leather-appointed seating available as part of the PRO-4X Leather Package (automatic transmission only). Xterra's versatile cargo area is highlighted by an available Easy Clean Cargo Surface and a total of 10 cargo area utility hooks – six on the floor/sides and four on the ceiling (floor hooks can carry up to 110 pounds each). There is also an available built-in first-aid kit and space to securely carry jugs up to a one-gallon size. Securing bike racks and other accessories or gear is made easier with an available adjustable channel system in the cargo floor, similar in design to the Utili-track™ system offered on the Nissan Titan and Frontier pickups (standard on S and PRO-4X models). Xterra also offers a few necessary amenities to make any adventure a little more enjoyable, including an available premium Rockford Fosgate®-powered audio system with eight speakers and subwoofer, steering wheel-mounted audio controls, MP3/WMA capability plus aux-in jack; Bluetooth® Hands-free Phone System; and SiriusXM Satellite Radio (S and PRO-4X models only, SiriusXM subscription required, sold separately). 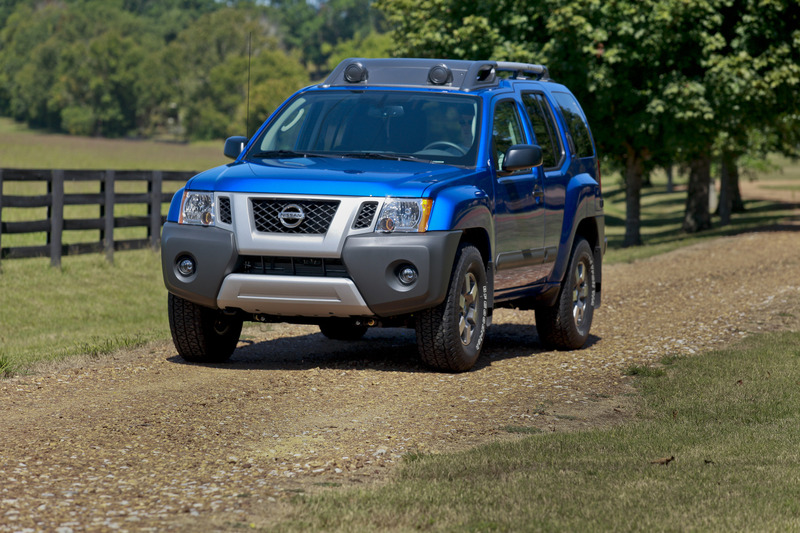 Underneath its unique exterior design, every Xterra features a fully boxed, all-steel ladder frame and a rugged suspension featuring a steel double-wishbone front suspension and solid axle leaf spring rear suspension, with stabilizer bars front and rear. Xterra PRO-4X models feature Bilstein® high-performance gas shocks, a rear tire deflector and skid plates covering the oil pan, fuel tank and transfer case (PRO-4X only). 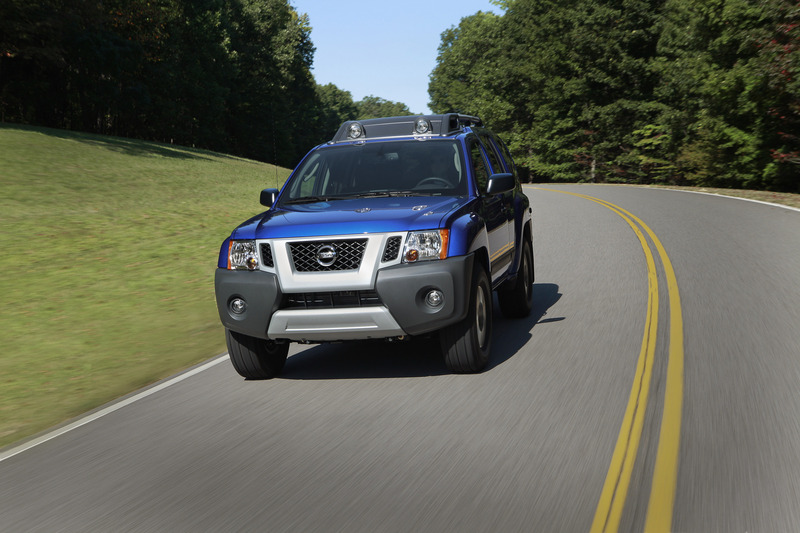 Powering Xterra is a standard 4.0-liter DOHC V6, rated at 261 horsepower and 281 lb-ft torque. The engine includes such advanced design features as lightweight aluminum block and cylinder heads, Continuous Valve Timing Control System (CVTCS), Nissan variable Induction Control System (NICS), silent timing chain and microfinished camshaft and crankshaft surfaces. Other engine features include Teflon®-coated pistons, resin intake manifold, digital knock control system and high capacity muffler. The engine's Electronic Throttle Control system includes secondary mapping in 4LO (4WD models). Two advanced transmissions are offered: an available electronically controlled 5-speed automatic transmission, with an emphasis on acceleration, fuel economy and shift quality, or a 6-speed manual transmission tuned for driving performance and fuel economy. 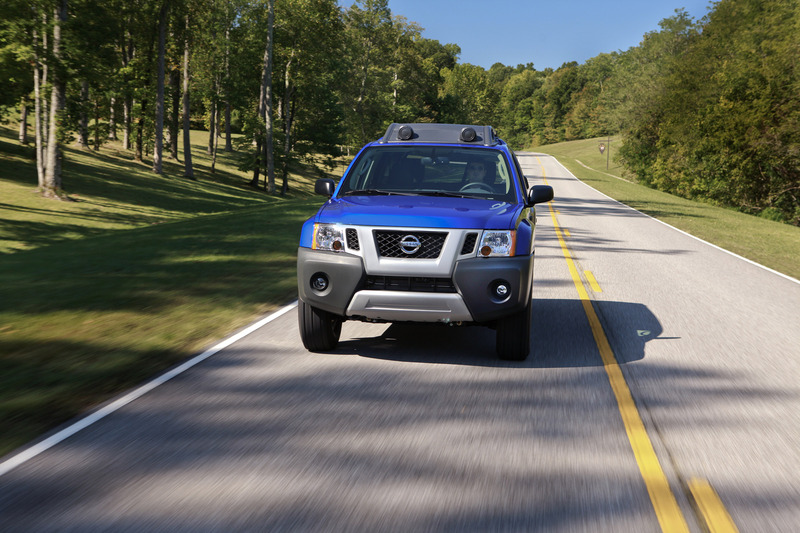 Xterra is offered in 4x2 or 4x4 configurations. 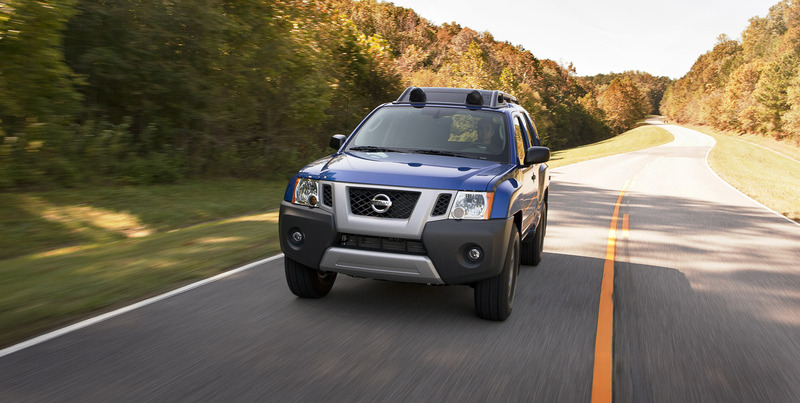 Xterra 4x4 models feature a part-time 4WD system with 2WD/4HI/4LO modes and electronically controlled transfer case. Xterra PRO-4X models include two advanced off-road technologies – Hill Descent Control and Hill Start Assist (automatic transmission only) – as well as an electronic locking rear differential. Other driveline components include engine speed-sensitive, power-assisted rack-and-pinion steering and 4-wheel vented disc brakes with Anti-lock Braking System (ABS) with Electronic Brake force Distribution (EBD). Wheel and tire packages include 16-inch steel wheels for Xterra X models and 16-inch aluminum-alloy wheels on Xterra S models. Both are mounted with 265/70R16 BFGoodrich Long Trail tires. Xterra PRO-4X models feature 6-spoke 16-inch machine-finished aluminum-alloy wheels with BFGoodrich Rugged Trail T/A tires. Xterra's list of safety features and equipment includes Nissan Advanced Air Bag System (AABS with dual-stage supplemental front air bags with seat belt sensors and occupant classification sensor), driver and front passenger seat-mounted, side-impact supplemental air bags and 3-point front/rear seat belts with pretensioners and load limiters and adjustable upper anchors. All Xterras also come with standard roof-mounted, curtain side-impact supplemental air bags with rollover sensor for improved front and rear-seat outboard occupant head protection. Additional standard equipment includes the LATCH System (Lower Anchors and Tethers for CHildren), Zone Body construction with front and rear crumple zones, Vehicle Dynamic Control (VDC) and Tire Pressure Monitoring System (TPMS). 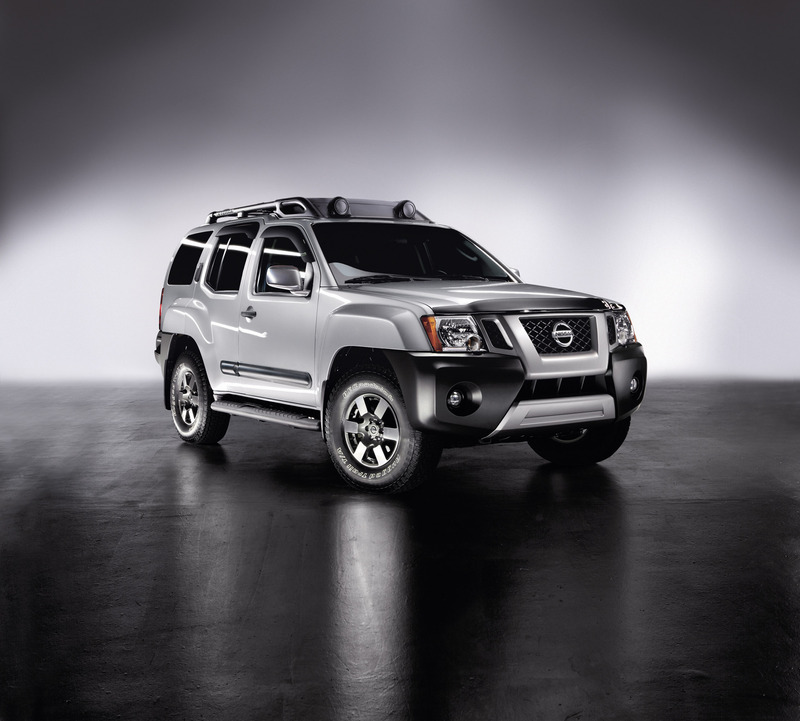 The 2013 Nissan Xterra is again offered in three models – X, S and PRO-4X, making it easy for buyers to determine the exact Xterra model for their particular needs and lifestyles. The PRO-4X model is available in 4-wheel drive only, while the X and S are offered in both 2WD and 4WD configurations. Xterra X models come with a 5-speed automatic transmission only, with S and Pro-4X models offering a choice of 6-speed manual transmission or 5-speed automatic. 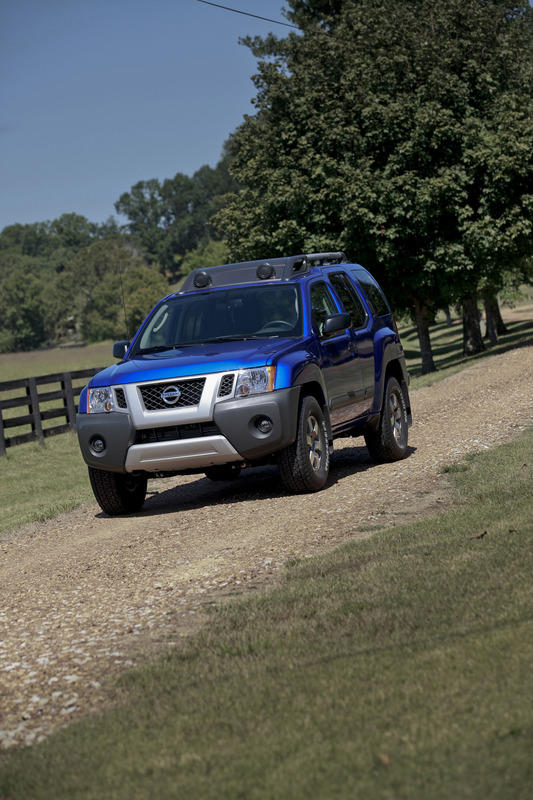 The entry-level Xterra X grade offers a long list of standard features, including Vehicle Dynamic Control (VDC), 4-wheel disc brakes with Anti-lock Braking System (ABS), power windows and locks, Remote Keyless Entry, cruise control, engine-speed-sensitive power-assisted rack-and-pinion steering, 60/40 split fold-down 2nd row seat and Nissan Advanced Air Bag System (AABS). Standard features for Xterra S include 16-inch aluminum-alloy wheels with BFGoodrich Long Trail tires, driver's seat lumbar support, step rails, Easy Clean Cargo Surface and C-Channel cargo floor with four moveable hooks and front tow hook (4x4). 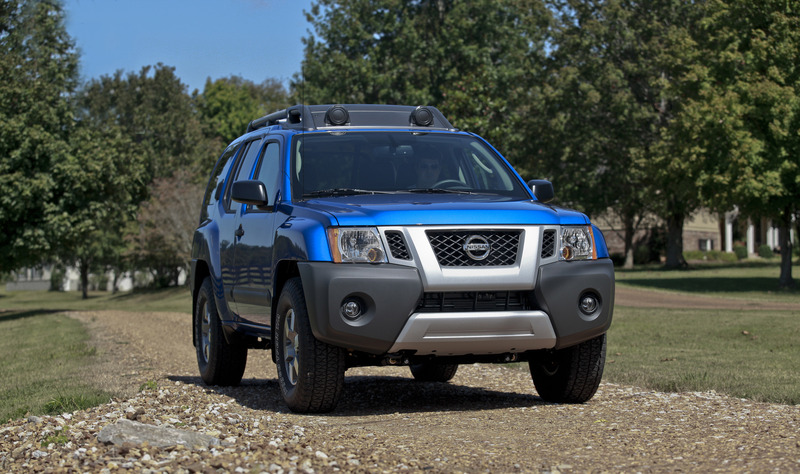 Other standard Xterra S equipment includes SiriusXM Satellite Radio (SiriusXM® subscription required, sold separately), cargo gear basket (4x4 only) and first aid kit. Xterra PRO-4X models feature Roof-Mounted Off-Road Lights in the air dam, silver headlight inner color, auto on/off headlights, black bodyside molding, fold-down front passenger seat with backboard, unique gray/white cloth seat fabric, sunglasses holder (overhead console), outside temperature display in rearview mirror, PRO-4X badge on tailgate and leather-wrapped steering wheel. Unique PRO-4X performance equipment includes 265/75R16 BFGoodrich Rugged Trail T/A off-road tires, rugged 16-inch wheels, Hill Descent Control and Hill Start Assist (automatic transmission only), electronic locking rear differential, high performance Bilstein® gas-filled shocks and oil pan, fuel tank and transfer case skid plates. All PRO-4X models also include standard RearView Monitor, Nissan Navigation System, Rockford Fosgate®-powered audio system with an in-dash CD changer, 8 speakers and subwoofer, steering wheel audio controls, SiriusXM Satellite Radio and black antenna (SiriusXM® subscription required, sold separately), auxiliary input and Bluetooth® Hands-free Phone System. Only one option is available: the PRO-4X Leather Package with leather-appointed seating surfaces and passenger seat back pocket.